How did you become the director of INK ASIA 2016? Tell us about your background. I am the co-chairman and director of Ink Asia art fair and Art & Antique International Fair Ltd is the company that organises the event. Andy Hei, the director of Fine Art Asia, is also the co-chair and we run the company together. There are three fairs organised by us, including Fine Art Asia, Ink Asia and Guardian Fine Art Asia. You may have already heard about Fine Art Asia. Ink Asia was founded last year by me and Guardian Fine Art Asia is in Beijing as the partnership with China Guardian Auction House. We bring Fine Art Asia to Beijing as our side of the partnership. Apart from Ink Asia, I have been also involved in Fine Art Asia for the last five years and it was only last year we decided to launch a new fair, called Ink Asia. You can describe me as more of a post art person. I have become passionate about Ink Art and would like to introduce it to the world, whilst Andy Hei focuses on Fine Art Asia. I think it’s good in terms of branding and strategy as we have different knowledge and expertise to promote to our gallery partners as well as the market. What inspired you to create Ink Asia? There are two main reasons. First of all, I see the business opportunities in this area for an art fair. A lot of people have asked me whether this move is too risky or brave to create an art fair specialising in only one category. But I have completely the opposite view as I see Ink Art as an important oriental language in the history and culture of China or Chinese-Asian regions. Besides, there are a great deal of supplies and resources for Ink Art, from artists, collectors, galleries to art lovers. To me, Ink Art is part of my Chinese DNA. Ink is spirituality or philosophy, quite intangible but I feel strongly connected with it. So in this context, I ask myself why don’t we start to promote Ink and create a platform, just like how Barnebys creates a platform bringing people together. I hope this fair can let people talk about Ink, collect Ink, share experience and also create a dialogue with the world. I believe there is a huge potential. Secondly, it’s about my ambition and cultural. I am very passionate about Ink and I believe promoting Ink or setting up a related fair should be done. We know our history and share the culture and understanding in this region. More importantly, we have seen China emerging rapidly in the last few years, particularly from a financial perspective. What comes next is the emphasis on culture, hence we start to talk about art, interact with the world and even offer to the world. After brainstorming for what type of arts to offer to the Chinese population, the answer is definitely Ink Art, because Ink belongs to Chinese oriental culture. It would be nice to have such platform in Hong Kong, an open and an international city. I welcome all kinds of galleries and collectors to learn and discover more about Ink. What type of visitors does the fair attract? I categorise the collectors into two tiers. One is the general art lovers and another is professional collectors. The market is so big and growing, so I want to engage with everybody. The fair also aims to attract professionals and gain recognition by the academic as well as the commercial world. Two types of Ink art will be introduced at the fair. The first type is the artists who apply ink as a medium and want to use this medium to create art work. Another type is the artists who understand the history and development of ink culture. What us Ink Culture? 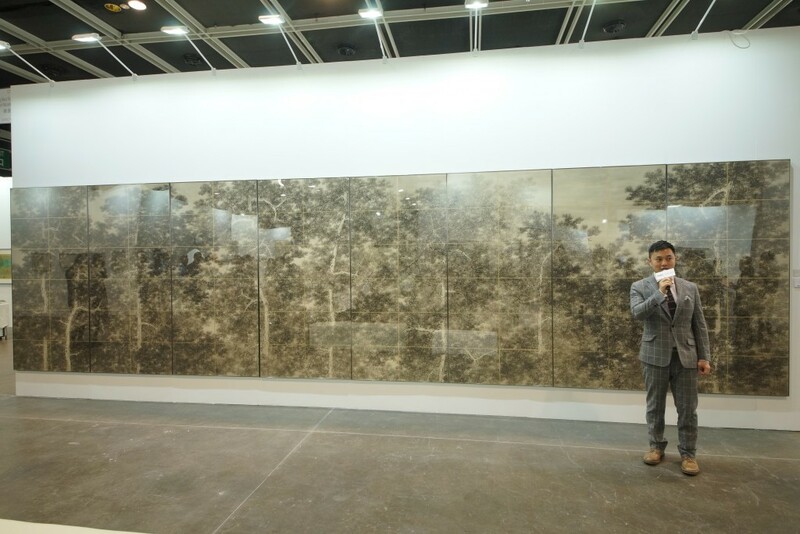 What is the reception for Chinese (Contemporary) Ink Art from Chinese or non-Chinese collectors? Ink culture always talks about spirituality and a connection with nature. We have a lot of artists in China or this region who would really like to share their passions to make the public understand their heritage and history. Some of them also try to innovate Ink art by adopting new concepts or reinterpreting the traditional aesthetic. On one hand, Ink carries the aesthetic beauty of Chinese culture; on the other hand, it is a very exciting medium for artists who want to break through. 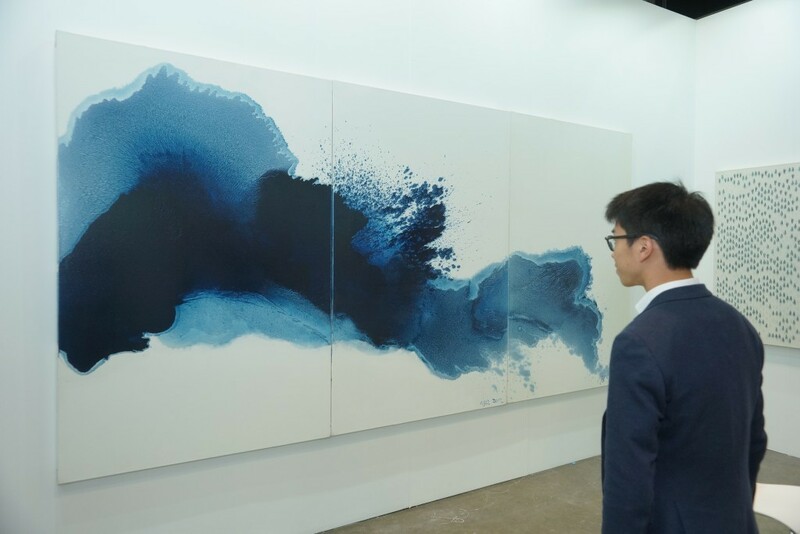 Last year many visitors described how they were amazed and surprised by the Ink fair as they saw Ink art from a new dimension, beyond the traditional perception. Ink is often associated with paper scrolls. So this is part of the perception we have as Chinese. Last year, I defined five pillars for the context of Ink Asia. These five pillars are fundamental, but I try to develop it every year without setting boundaries. In the beginning, I set up the five pillars because nobody understood this abstract concept: ''Ink Art, what is that?'' 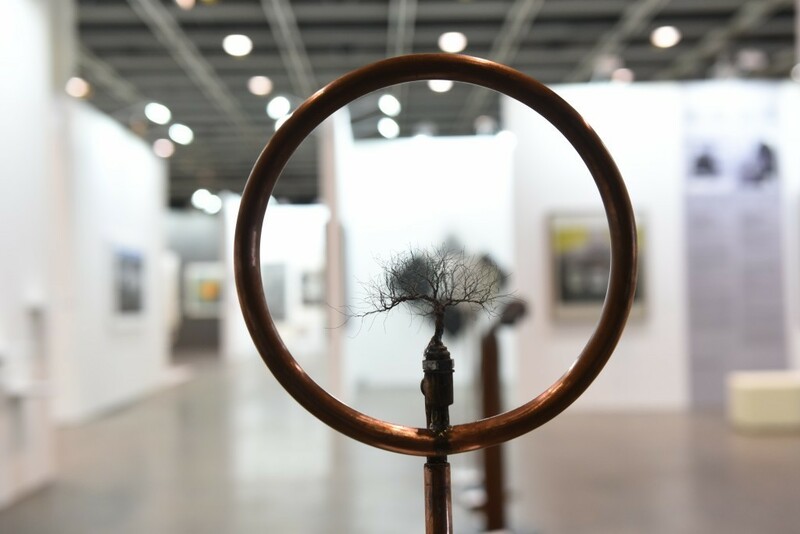 In the end, the fair was presented to the public with a contemporary setting exhibiting photographs, installations and traditional paper scrolls! I think both Chinese or non-Chinese audiences felt very impressed because this fair brought a new possibility to the market. 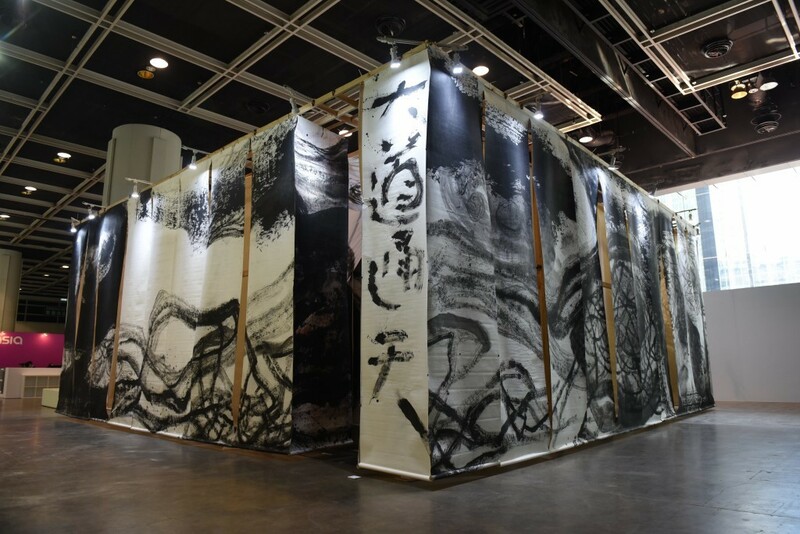 Guan Weibang's large scale installation "Song Bi dense"
What is new and what are highlights for the 2016 edition of INK ASIA? This year I set up a session called 'SPOTLIGHT, featuring solo artists exhibitions and another program called HIGHLIGHT. This year, we haven’t used the five pillars concept to promote the fair, as we did last year. HIGHLIGHT will feature 12 galleries, which have invested a lot of effort into promoting ink art. They are established galleries who have the muscles to stretch. From these 12 galleries, you may find some hints of future trend. In theSPOTLIGHT section, I encourage the galleries to nominate one single artist to host their solo exhibition in the fair. So now we have a group of booths called individual booth. In the first year, it was pretty difficult to convey the concept of ink art as it is new. That’s why I set up five pillars to describe what the ink fair is. I am very impressed that the recognition came very fast after our first fair. That’s why this year I've created and developed the new themes, including SPOTLIGHT and HIGHLIGHT. Apart from installations, this year we have an academic programme presented by Ink Society. What advice would you give to the new collectors? You need to know what you like. Setting the budget, doing homework/research, browsing the Internet to see new things, attending a variety of exhibitions or fairs and meeting artists is very useful. When your collection is purely for pleasure, don’t put too much stress on it. Go collect it! Don’t ask how much it is or what it will be worth in a few years time as your first questions. Unless you are collection to invest, in which case then you do not need to care about your taste. Investment in art is another board game and a different interesting topic. How has the art market, particularly Ink Art, changed since you started? It has been four years since the real boom of Ink Art, 2011-2012. I see the Ink Art market, or the development of the Chinese art market in large, is still quite primitive. The market started in 2006-2007 and since then we experienced the financial crisis as well as political turmoil. The Chinese art market is strongly dominated and greatly influenced by auction markets. Hence I believe the eco systems of Ink Art, or general art market is still under development. There are a lot of areas in this system that need to be set up or nurtured, such as museums. We do not have the scale of such museums as the Tate modern in the UK and the academic support is comparatively thin. Despite my mention of the dominance of the auction market causing the unstableness, they do create the awareness and need for art. It is good to see they make galleries and art lovers participate. I see a lot of opportunities in this developing market. Most importantly, this market is so big because of the large Chinese population and a growing number of collectors and artists. 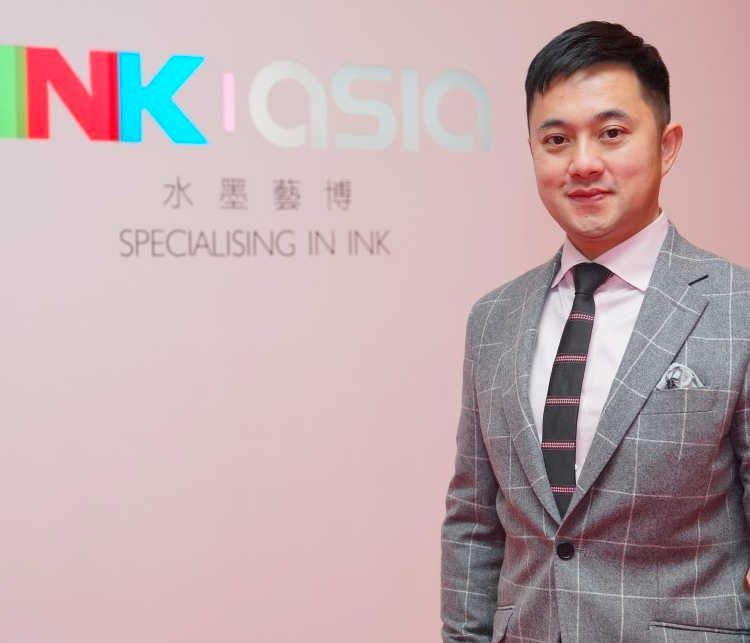 I hope Ink Asia will become a professional and recognised platform to benchmark the Ink development or to create an opportunity allowing people to discuss and shape the future trend together. What do you think about Barnebys, an online search engine which gathers all the arts in one place? It is a very important and useful platform to make art information become easy access and transparent. The search engine helps to promote and educate the collectors and general public. I think this is good to see more websites specialised in art, and this enhances knowledge sharing. I am hoping to see a more specialised art portal with art expertise and strength and I believe this is the future trend.